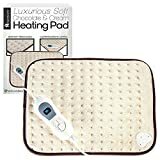 Why choose this Luxurious Soft Body Heating Pad? Makes a perfect Christmas, birthday or get well soon gift! Switch on the appliance using the hand-operated switch. The indicator light indicates the currently used temperature level. The product after about 90 minutes switches off automatically as an added safety function. In order to put the heat pad into operation again you must first set the switch to the ‘0’ position and after about 10 seconds you can switch on the heat pad again. When not in use switch the control switch to the “0” position and unplug the power cord. Click “Add to Basket” to get your Luxurious Soft Electric Heat Pad today!